Hello! 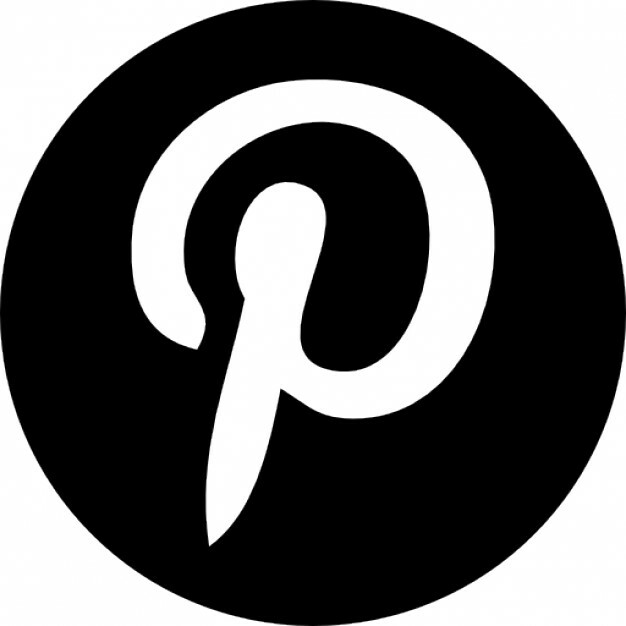 I am so happy to be here as a Guest Designer for Authentique Paper! I will be around for a few months! I have long awaited an invitation to join the fun here, and I confess I may have begged just a little bit! 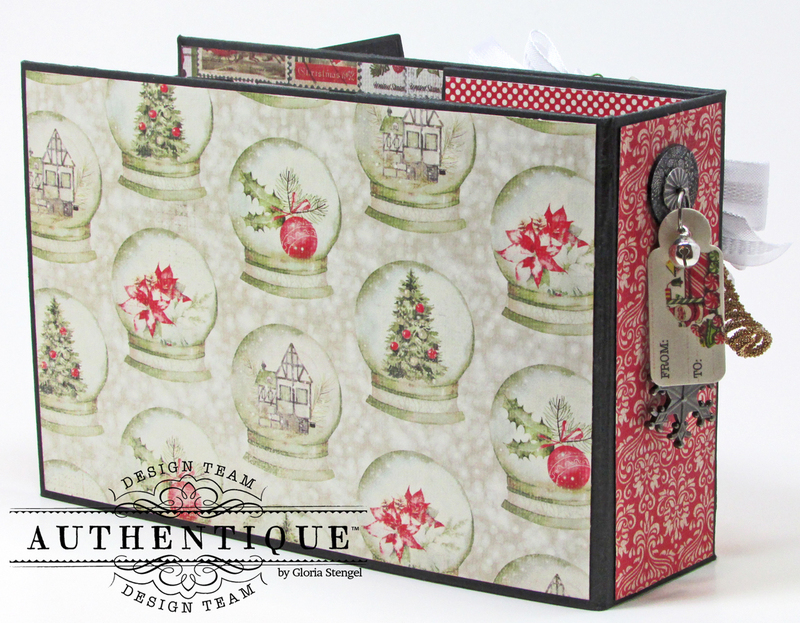 I was sent the Christmas/Winter Collections to work with, and for my first project I decided to create a mini album with the Vintage Christmas Collection. 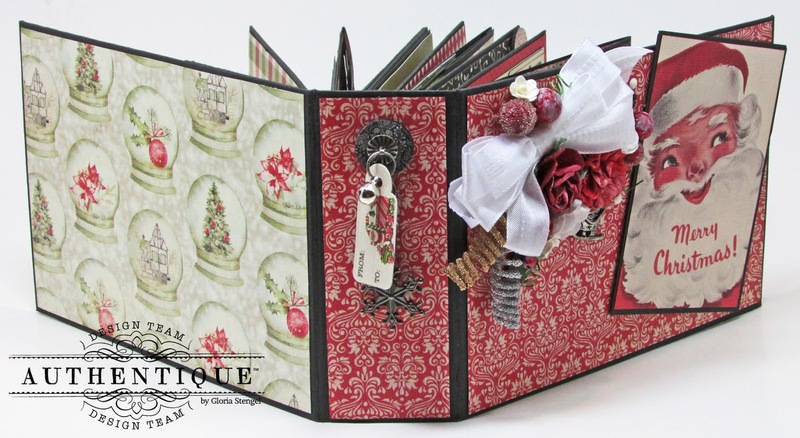 This jam-packed mini album measures 4 1/2" tall by 6 1/2" wide, with a 1 3/4" spine. 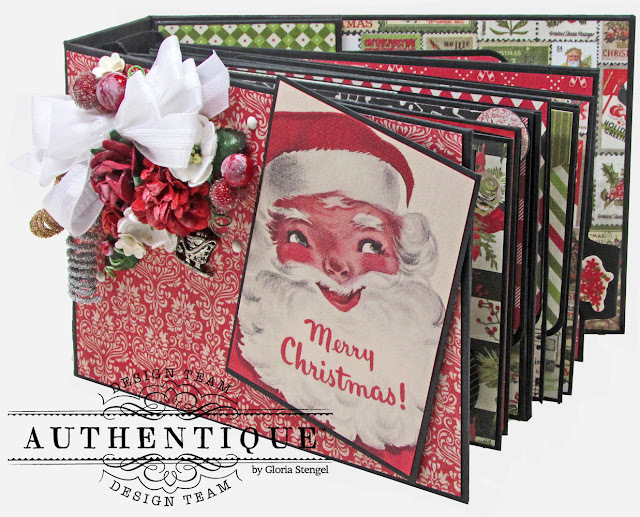 I created the album from chipboard and added three page sets to the inside. Each page set has multiple flips, folds, tags, and pockets! 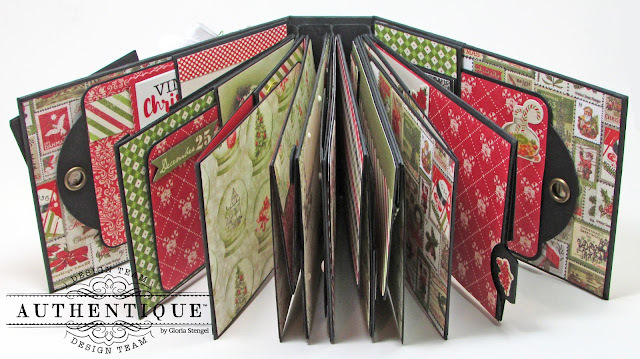 The chipboard is wrapped with black cardstock to create a wonderful border for the beautiful paper. 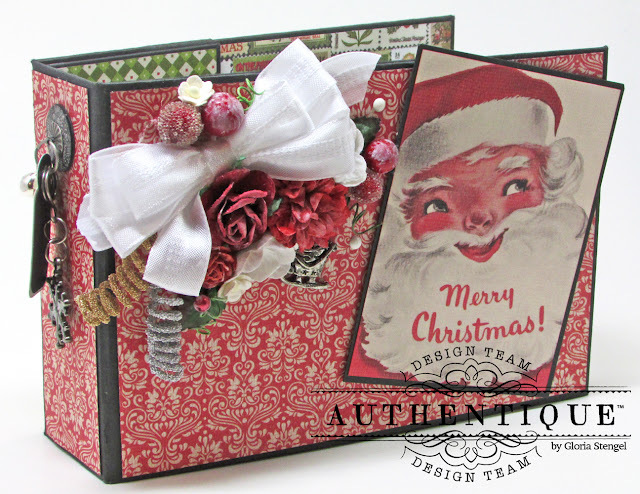 The red and green color scheme of Vintage Christmas has black accents and wonderful vintage imagery. I used the Vintage Christmas Collection Kit (with Stickers) and the Vintage Christmas Bundle (6x6 Paper Pad) for this project. This fun and chunky book is filled with places for photos, journaling, and memorabilia. The book measures more than twelve inches when opened. 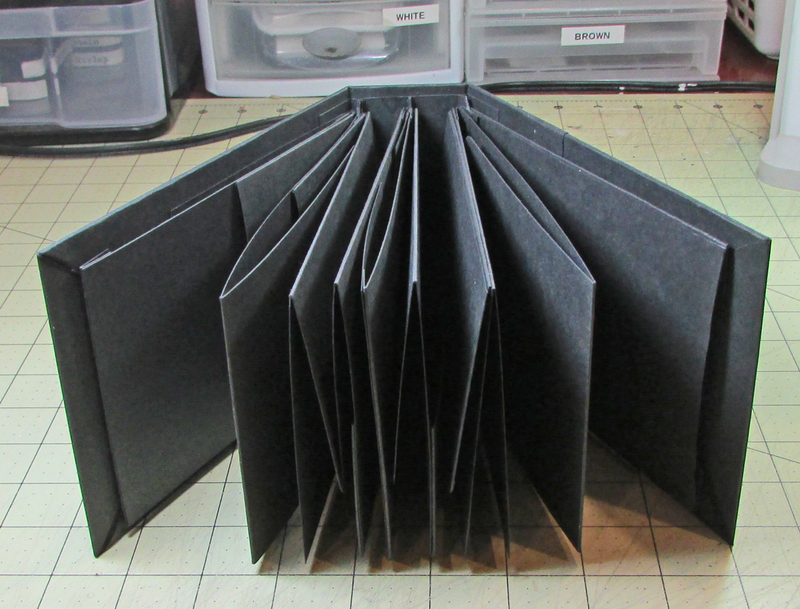 Since paper and cardstock only comes in 12" x 12", I wanted to share a tutorial for covering your book base. 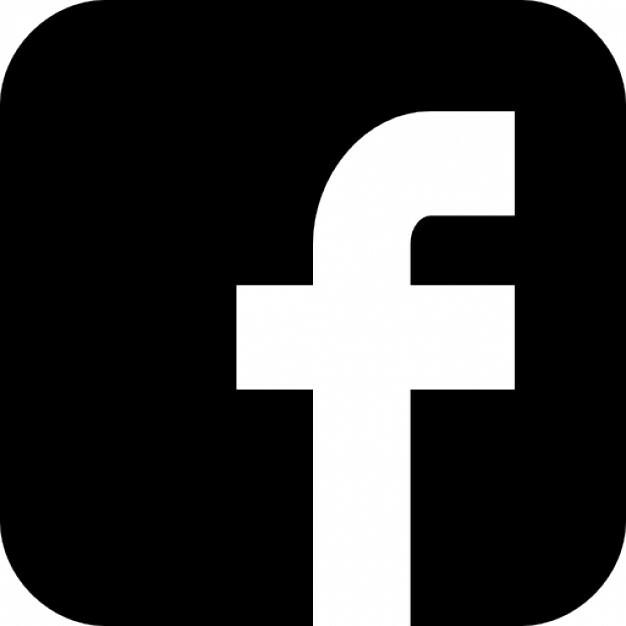 Cut black cardstock to 6 1/2" x 12" and draw a line 1" from the right edge as shown. Cut a second piece of black cardstock to 6 1/2" x 6". Place double-sided adhesive on the 1" section, as shown. 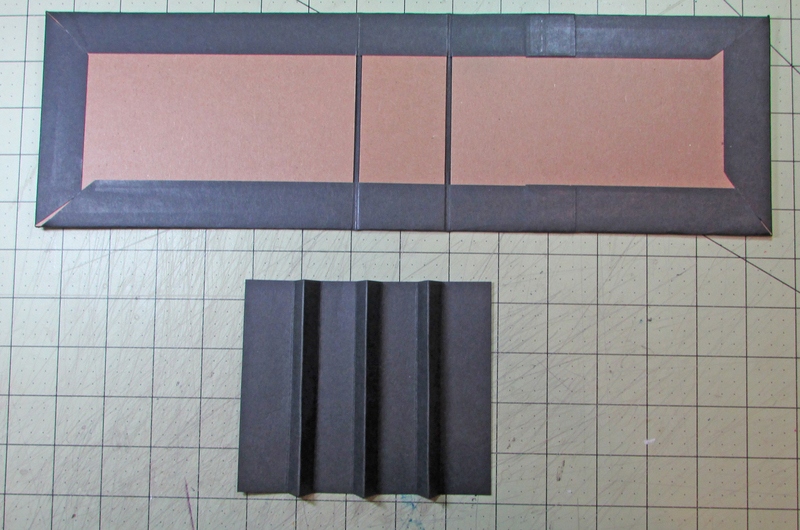 Then, attach the smaller piece of cardstock to that one-inch tab, making a piece that is 6 1/2" tall by 17" wide. Cut two pieces of heavy weight chipboard to 4 1/2" x 6 1/2" for the front and back covers. Cut another piece of chipboard to 4 1/2" x 1 3/4" for the spine. 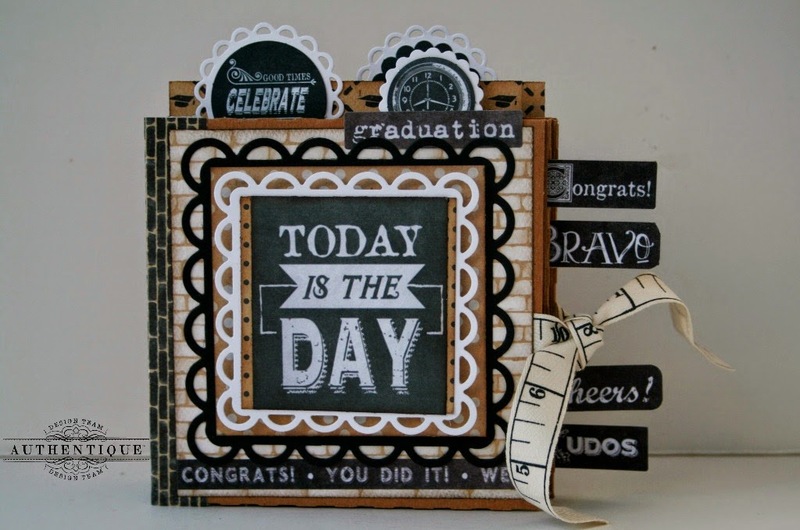 Place the chipboard onto the center of the black cardstock. Make sure to leave 1/8" spaces between the spine and each cover. Add adhesive around the edges of the cardstock. Angle the corners. Wrap the cardstock around the chipboard as shown. Make an accordion-fold page hinge. I created mine to be 4 1/4" tall with 1/2" page tabs and 3/4" gutters. I have three page tabs. Place the hinge mechanism onto the spine. Add double-sided adhesive to both sides of each hinge tab. Once I had my book all assembled, I decorated the cover and the inside pages. 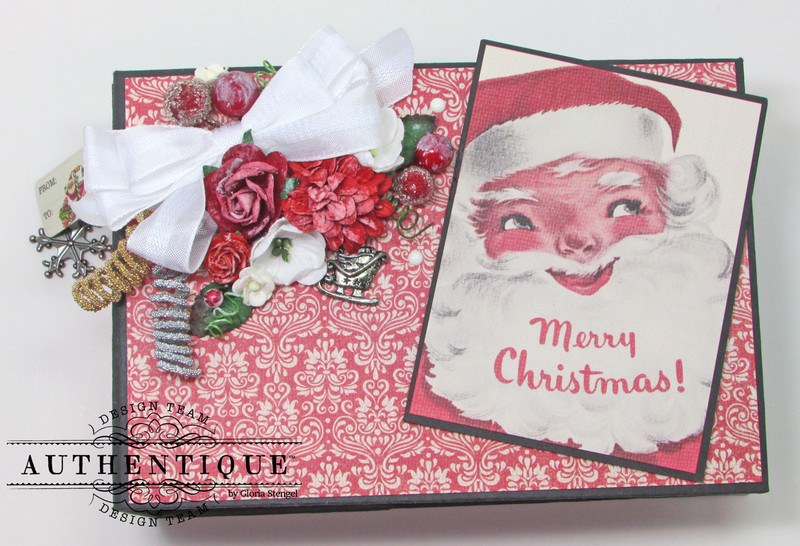 I wanted to use one of the sweet ephemera cards for the front, and chose this kind, smiling Santa image! 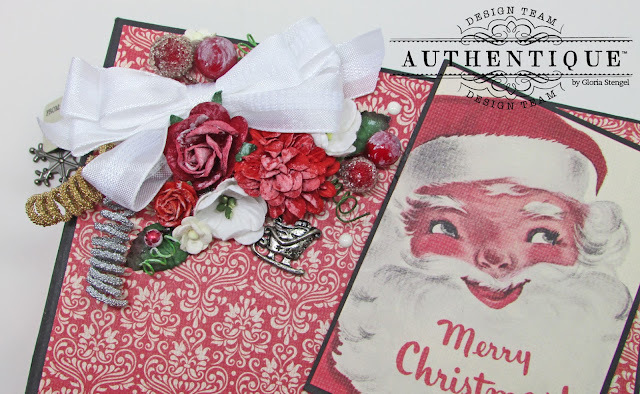 I glued a cluster of ribbon, flowers, and charms to the book cover to give it a vintage Christmas feel. I dangled some charms along with one of the sticker tags from the spine of the album. When working with sticker elements, I always attach them to cardstock for extra stability. Lucky for me, I had a die cut template to exactly match this tag sticker! Check out all those pages, pockets, and tags! Christmas eye candy! I also created a pocket for both the inside font cover and the inside back cover. 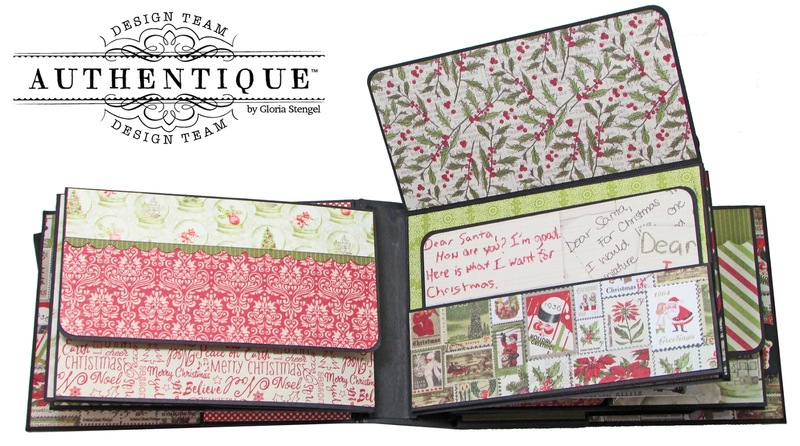 The pockets are perfect for a large tag or extra photos. Some of the pages have pockets and some are plain, for adding photos. Other pages have flaps and hidden pockets! The pages are decorated simply with enamel dots, stickers, and other small embellishments. This mini has far too much to see for a photo spread. 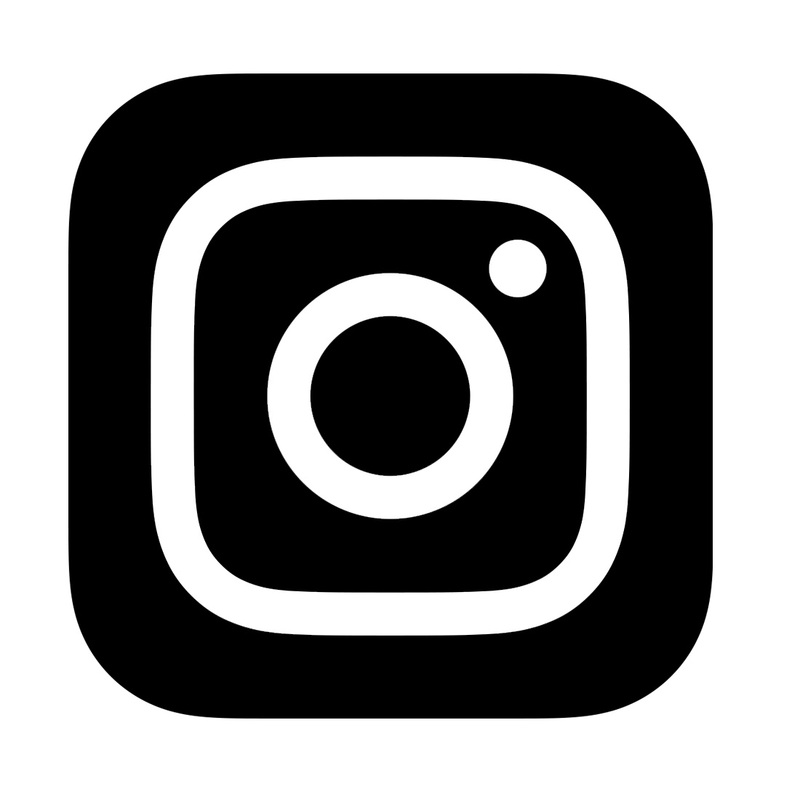 I have created a video to share all the inside pages. If you want to see every page, plus all the tags and pull-outs, please visit my YouTube video, linked above!